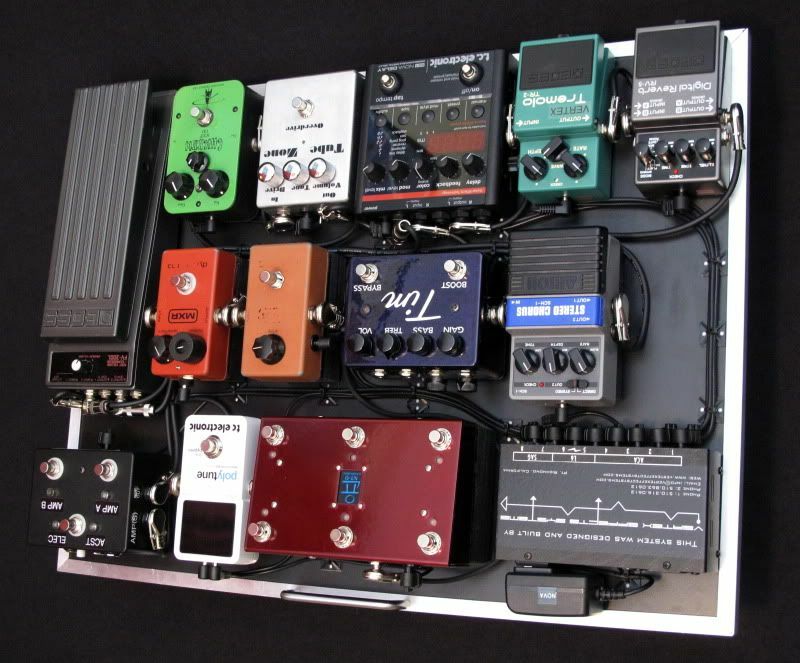 Here's a pedalboard that I finished for a local Bay Area worship leader that was looking to re-vamp his pedalboard for a more compact and less complicated rig. 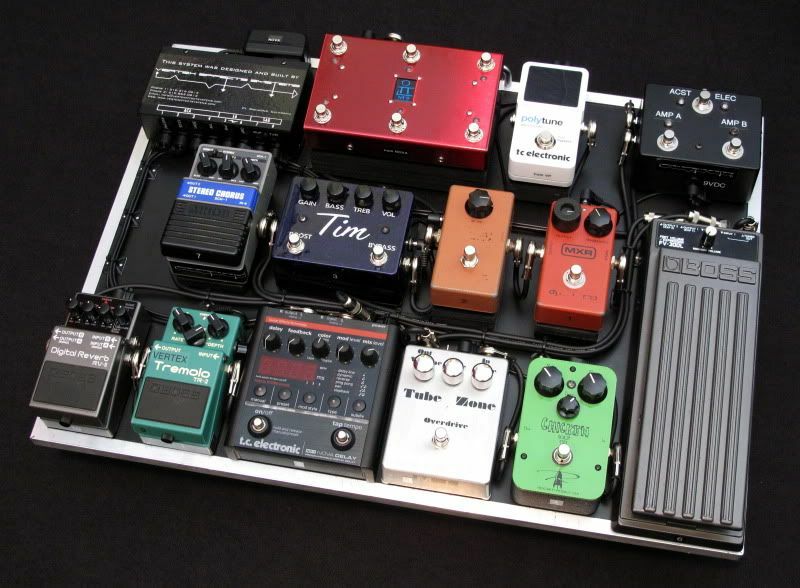 The pedalboard gets some great rack-style tones, and also does well with U2-ish stuff. Of course, it also does some great straight-ahead rock and alternative country (the Chicken Soup (Nobles), TIM, and Dyna Comp are so interchangeable and just sound magic). 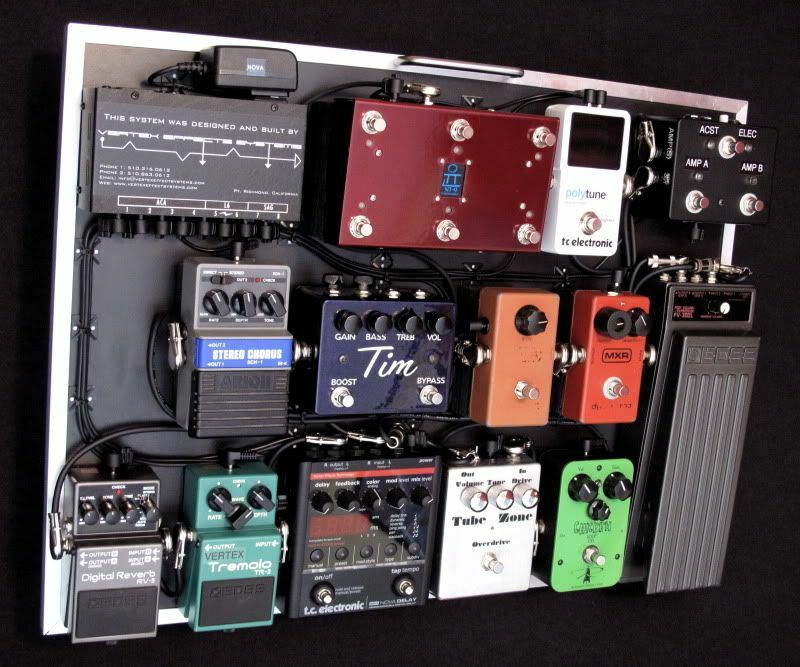 The interface has two separate inputs, one for an electric guitar that goes through the pedalboard (then out to the amps), and another input for an acoustic guitar that breaks out to a L.R. Baggs Para Acoustic DI/Preamp and then to the house. These two inputs are switchable (A/B) with a footswitch. The electric side has a Vertex Tri-Buffer (one input buffer, and two output buffers), and A/B/Y switching. This allows the rig to be run into 2 amps in stereo, or to A/B between two amps for clean and dirty (or any other orientation desired). The output to Amp B is transformer isolated to prevent any grounding issues. There is a polarity switch for the amps so that they stay in the proper polarity (commonly referred to as "phase"). *acoustic input breaks out to an L.R. Baggs Acoustic DI/Preamp, electric input goes to the input buffer and out to the pedals on the pedalboard. Vintage MXR Dyna Comp, Vintage MXR Phase 45, TIM, Rockett Chicken Soup, MI Audio Tube Zone, Boss FV-300L Volume Pedal (T.C. Polytune), Arion SCH-1 Chorus (Landau Mod, no True Bypass), T.C. 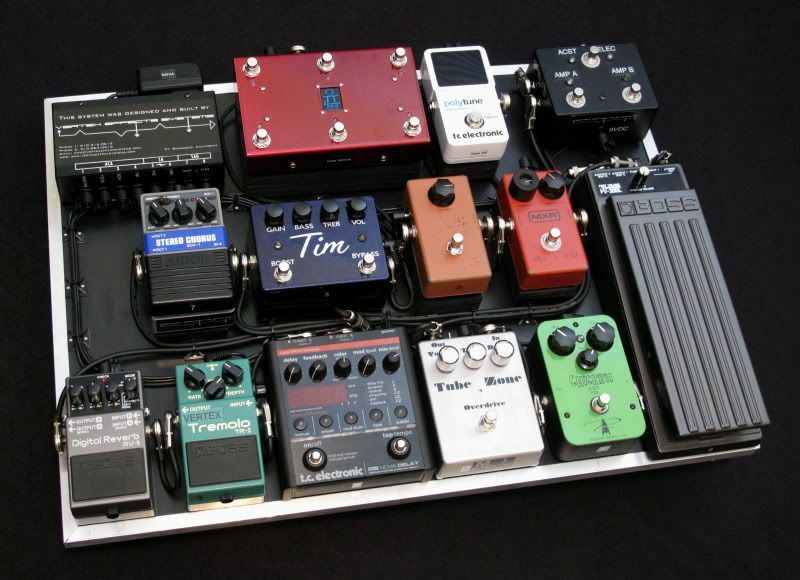 Electronics Nova Delay (out to YounWorks NT-9 to control presets), Vertex TR-2 Tremolo, Boss RV-5 Reverb, INTERFACE (with A/B/Y out to run the rig as an A/B through two amps - one at a time, or stereo, combining both amps at once.